ELKHART LAKE, Wisc. (3 August, 2018) – Kelly–Moss Road and Race (KMR) will challenge Road America’s demanding 4.048-mile circuit with a five-car lineup in the IMSA Porsche GT3 Cup Challenge USA by Yokohama during the Continental Tire Road Race Showcase on August 3-5. Every visit to Road America is a special one, but this weekend’s IMSA event is particularly sought after as the Madison, Wisconsin-based team celebrates its 30th season of competition at the home track. Having won the very first race it entered — the IMSA Firestone Firehawk race at Road Atlanta, the team has since developed a tremendous history of success with Porsche, competing in every IMSA Porsche GT3 Cup Challenge USA by Yokohama event since the series inception. Porsche GT3 Cup Challenge USA will compete on Saturday and Sunday as part of the IMSA WeatherTech SportsCar Championship weekend. The twin 45-minute sprints will serve as Rounds 9 and 10 of the 16-race 2018 season. 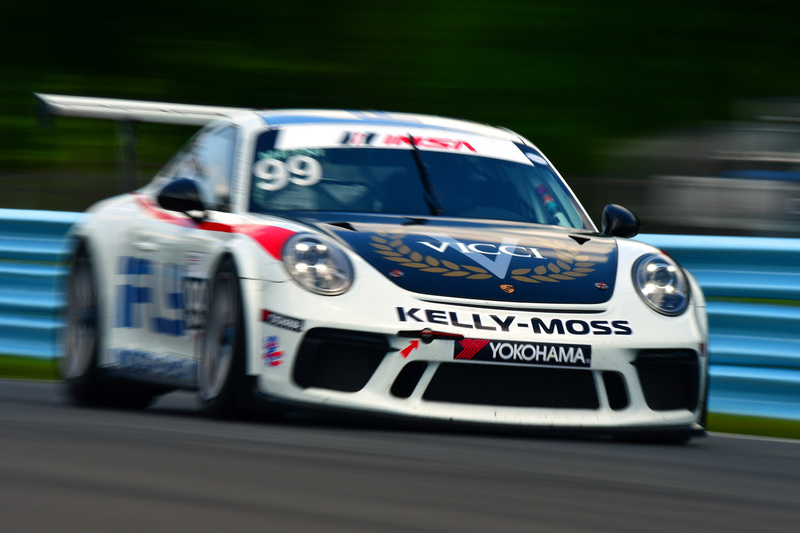 Roman De Angelis leads Kelly–Moss Road and Race’s three-car entry in the Platinum Cup, which showcases the latest-generation 2017-18 Porsche GT3 Cup car. Driving the No. 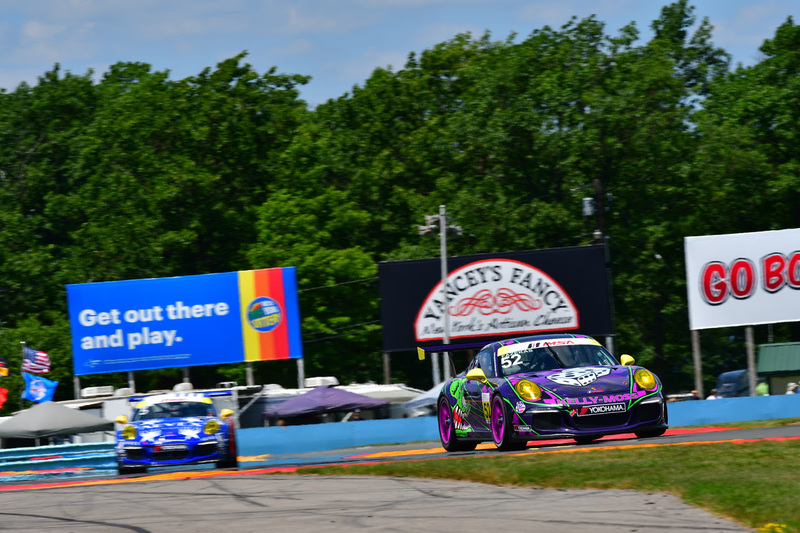 1 Porsche sponsored by Racing for Children’s MTP and Fortis Group, the 17-year-old resident of Belle River, Ontario is coming off a double-podium weekend at Watkins Glen. He scored his second triumph of the season in the opening race and placed third in Race 2, and now trails leader Trenton Estep by 13 points (256-243). Alan Metni of Austin, Texas continued to gain ground in the Platinum Masters competition, winning the most recent round at The Glen after scoring second in the opening race. It was his second Masters victory of the season – coming off a triumph at at Mid-Ohio driving the No. 99 iFly/VICCI Auctions/AM Motorsports Porsche. He moved up to second in the Masters points, and now trails the leader by only five points (244-239). Also competing in the Platinum Masters is the No. 61 of Scott Welham of Louisville, Ky., who finished fourth and fifth at Mid-Ohio and sat out the Watkins Glen weekend. He now stands eighth in the Masters points. KMR will also have two Porsches in the Gold Cup class for cars from model years 2014-16. Wisconsin driver Greg Palmer of nearby Colgate is in the No. 44 Porsche, while Kurt Fazekas of Indianapolis pilots the No. 52. 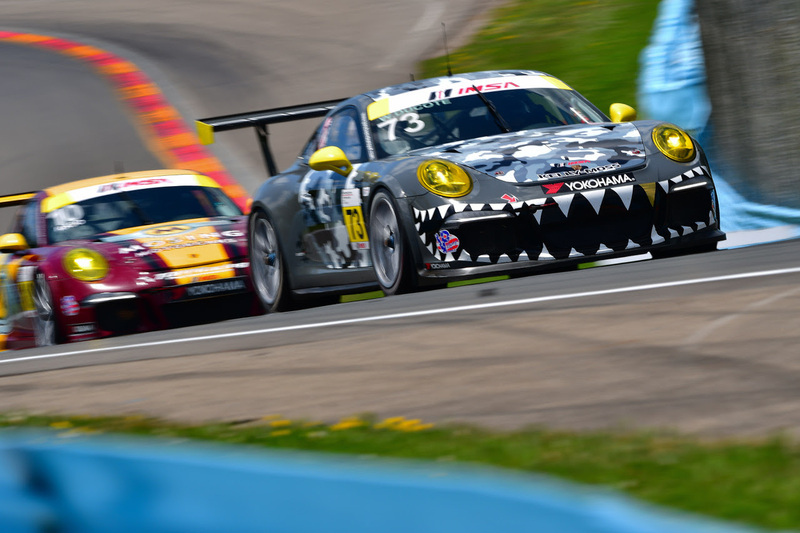 Fazekas recorded his third consecutive pair of podium finishes at Watkins Glen, winning the opening race for his second victory of the season and then finishing second. He remains second in the standings, cutting leader Victor Gomez IV’s lead to 17 points, 268-251. Palmer finished fifth in the second race at Watkins Glen, and remains fifth in the standings with 206 points. Kelly–Moss Road and Race enters the weekend second in both the Platinum and Gold Cup Team standings, just seven points from the Platinum lead and 12 markers back in the Gold Cup. The Road America weekend opens with a pair of practice sessions on Friday at 8:55 a.m. (45 minutes) and 1:15 p.m. (30 minutes), all times CT. Friday concludes with a 15-minute qualifying session at 5:25 p.m.
Saturday features Race 1, a 45-minute event beginning at 11:30 a.m. Race 2 will be Sunday at 9:40 a.m., and will also be 45 minutes in duration. The races will be broadcast live on IMSA.tv, on Saturday at 12:20 p.m. ET and Sunday at 9:30 a.m.